How can I protect my favorite slippers from my puppy's sharp teeth? Chewing is a normal dog behavior, but it needn't be a destructive one. Armed with a little knowledge and foresight, you can easily prevent damage. All puppies chew. It is your job to provide the dog with appropriate chew toys. Hard Nylabones, Kong toys and rope toys are all safe, quality toys. Your job is to make sure that your dog knows what is appropiate for him to chew. Be clear with your dog by playing regularly with him and an appropriate toy. Praise when you see your dog chewing on an appropriate chew toy and re-place anything inappropriate with a fun and acceptable chew toy. Don't give your dog toys that resemble household items. 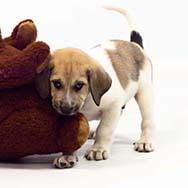 If your child loves stuffed animals, no plush toys for your dog. If you have oriental rugs, don't give the dog rope toys with long tassels. Your dog can't decipher the difference and it's not fair to punish for what she can't understand. Dogs need practice being successful. When you can't supervise your dog, confine her. Crate your dog when you are away and provide her with one or two chew toys to keep her occupied. If you are home and want to leave the dog loose but are not able to watch the dog closely don't just let her wander. Tie a 4-foot leash to a nearby furniture leg or around your waist, give the dog a mat, a couple of chew toys and let the dog enjoy her time with you without getting into trouble. Supervise, supervise, supervise. If the dog doesn't get in the habit of chewing the dining room table, you won't have to expend energy teaching her not to chew your valuables. Exercise your dog. All dogs need daily exercise; otherwise all that pent up energy will have to come out somehow, oftentimes through chewing. Daily walks are nice, but don't suffice for most active dogs. Be honest with yourself. Is your dog getting at least 20 minutes of vigorous exercise every day? If not, start running, fetching, swimming or biking with your dog to help her expend all that energy! Puppies, especially from 3-5 months and again at 12 months, tend to chew due to mouth pain from teething. To help relieve discomfort, freeze a kong stuffed with peanut butter. Let your dog chew on it for 30 minutes at a time to numb the mouth. If you catch your dog chewing something, don't make a big deal of it. Calmly remove the item and engage them with something appropriate. If they have chosen furniture or a rug, spritz the area with bitter apple and don't let the dog in the room without supervision.